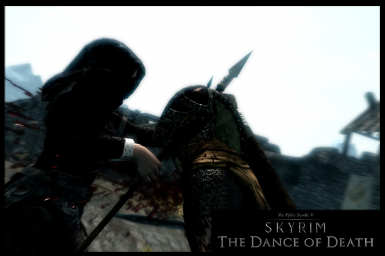 An epic killmove mod designed to be completely user-friendly and offer players a greater degree of control over their killmoves. Now updated for all current DLCs! Feel free to edit TDoD on your own CK, but if you want to publish it online, you'll need to seek my permission first. Danni, for the original Killmoves+, which inspired me to start using the CK. Bethesda, for making Skyrim, also known as Life 2.0, with all of the boring bits removed and more werewolves. New option added to MCM: Advanced tab, for toggling killmoves grouped by appearance on or off. Conditions fixed on miscellaneous killmoves. New option added to Main Menu; "Restore Default Settings"
Complete overhaul of TDoD for the 1.6 Update. Return to loose file archiving after reports of bugs with .BSA archiving. Added faction "Has Scripted Killmoves" faction, solving a bug with scripted killmoves not performing under certain conditions. Added 2-Handed killmoves vs. various creature types to be available to pure One-handed or Weapon-and-spell characters. 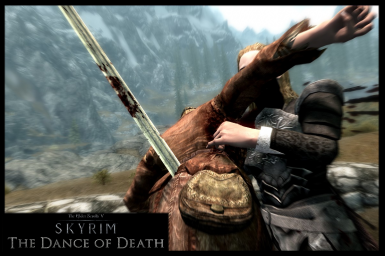 Added constraints to DW impaling killmoves to prevent axes and maces from performing them. 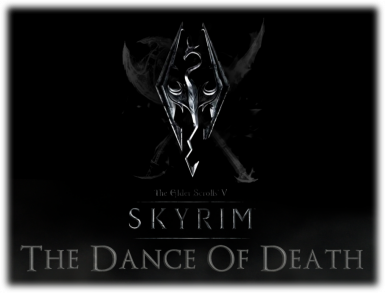 Spell name changed from "Dance Of Death Settings" to "The Dance Of Death." Dance Of Death Spellbook and Lectern removed from Dragonsreach. 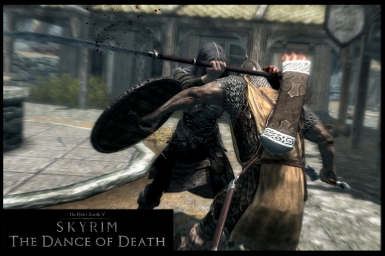 2 New Waraxe killmoves and 1 new mace killmove added. OnlyPlayer system changed to Player Immunity. 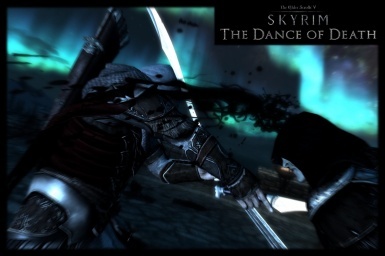 Dual Wielding now has two decapitation killmoves; one for mid-combat, and one for last enemy. Relocated the Spellbook and stand to behind Farengar's Map Board. New Dragon Killmove added, probabilities reshuffled, last hostile actor condition removed from Dragon Killmoves. In-game readme added to the bookstand to help new users configure the mod. New scripts implimented; Forcekillcam added. Added Perk Restrictions on the TDOD killmoves, and an optional setting to bypass them. 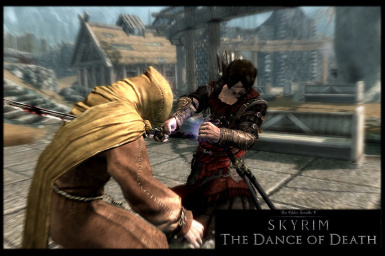 Added a spellbook that teaches the power "Dance Of Death Settings," which opens a menu that allows for the adjustment of chance values, a Perk Restrction Bypass and Forcekillcams. 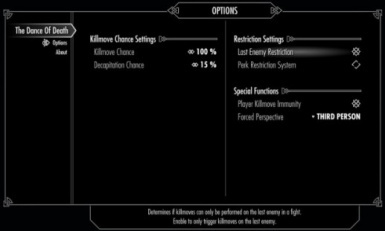 Another protoype version of the mod where players must unlock new killmoves by investing in appropriate perks. Added 3 new killmoves to the 1Handed tree. Ladies and Gentlemen, I am pleased to offer you an alternative to The Dance of Death for your killmoving pleasure. VioLens - A Killmove Mod by lRekol, offers most of the same functions as TDoD, as well as a very ingenious scheme for manipulating ranged killmoves. Moreover, VioLens has the full support of its author, who is active in ways I can no longer be thanks to my own personal commitments. 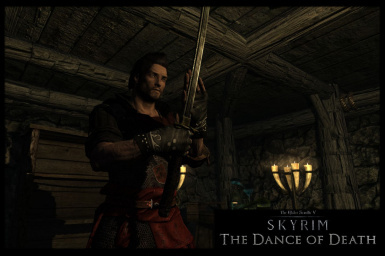 The Dance of Death will still be here for those that want to use it, but there's no malice on my part if you guys want to migrate to a more active mod with somebody that has the ability to keep updating and helping the users out. 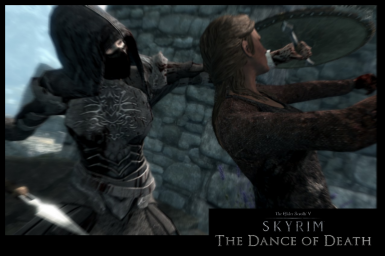 The Dance Of Death version 4.0 out now! 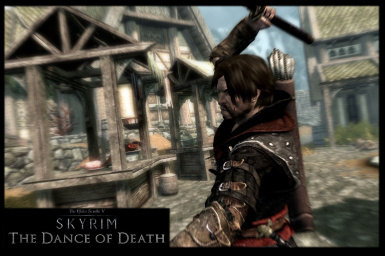 4.0 comes in three versions; Classic, Dawnguard and Ultimate (all DLCs) Edition. When downloading, make sure you acquire the version which correlates to the DLCs you have installed, otherwise the game won't load properly. This new version utilises SkyUI 3.0's Mod Configuration Menu system (MCM) and will require both this and the latest version of SKSE in order to run. 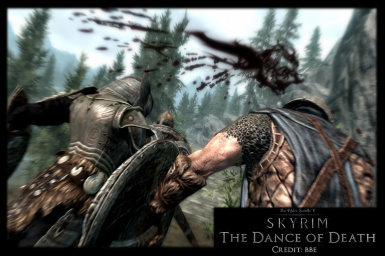 The main features added by The Dance of Death are the addition of a plethora of previously unused or unassigned killmoves to the various melee combat types used throughout Skyrim, and a Mod Configuration Menu which can be used to control the settings which affect them. Once highlighted, each setting has a description field beneath the menu which discusses the effect of the setting, as well as what enabling or disabling the setting in question will do. Any alteration to these values will be saved between gaming sessions, and the changes to the settings are unique to each character. This means that every single one of your characters can have their own unique variation of the settings saved, without needing to change or revert the settings when changing between characters. 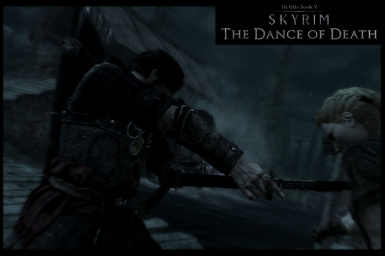 The Dance Of Death features a brand-new 'Perk Restriction System," which can be used for play styles favouring immersion or those seeking to feel rewarded as their character grows in weapon skill. New killmoves are unlocked by gaining specific perks associated with the weapon types that the killmoves are for. As the player unlocks these perks, their repertoire of killmoves will continue to expand to match their character's developing skill level. The P.R.S can be disabled at will to give players full access to all of the non-decapitation killmoves with no required weapon skills or perks. Decapitations will still require their respective perks to occur. Champion Stance - Unlocks 1 Greatsword Killmove, and a variety of Killmoves vs Creatures for Greatswords. Note: "Single Blade" refers to a single bladed weapon, with or without a shield equipped. "Single Blade Only" refers to a single bladed weapon with either spells or nothing equipped in the offhand. 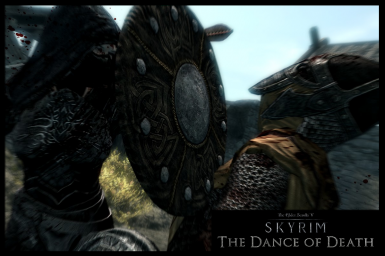 Shield-Based killmoves are also treated differently by The Dance of Death 3.0 series. Killmoves featuring shields as a part of the animation, such as shield bashing, deflection or charges, will only occur when the player is blocking with their left hand and performing a "Power Bash" attack by pressing or holding down their attack key. These killmoves will trigger at the same threshold as regular killmoves, and behave in an identical manner to standard killmoves. 3: Enable the new version of TDoD. If you encounter no increase in killmove frequency after adjusting these settings, then you will require FNIS as well. 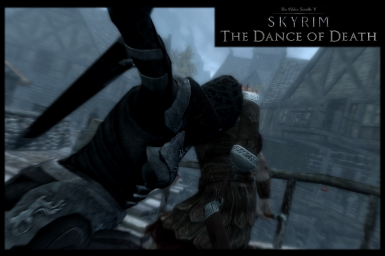 Some animation replacer mods, either basic or complex, can inhibit TDoD's functions and prevent killmoves from occurring. 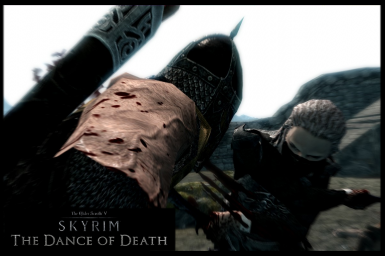 By running FNIS, and executing the GenerateFNISForUsers tool while ticking the applicable mods, FNIS controls these other mods so that they don't inhibit The Dance of Death's functionality. Note that when updating from 3.9 to a higher version, note that a clean save is NOT necessary. 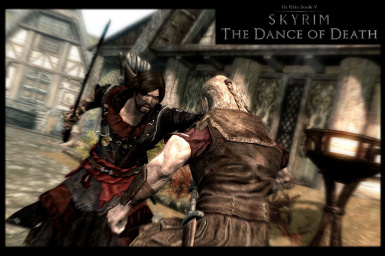 -Skyrim version 1.6.89.0 or higher. V1.3 - Added new killmoves to various weapon types; 2 to Greatswords, 1 to Maces/Axes, 1 to Warhammers/Battleaxes, reshuffled some probabilities. V1.4 - Probability statements converted from < to <=, and from = to <= in some cases. New H2H killmove added. V1.5 - Addressed issues with the one-handed killmoves, added 3 new killmoves to the 1Handed tree. V1.6 - Fixed issue with killmovechance not modifying proportion of killmoves that occur. V1.8/1.9 - Prototype variants on the future iterations of TDOD. v2.0 - Forcekillcam added. Added Perk Restrictions on the TDOD killmoves, and an optional setting to bypass them. Added a spellbook that teaches the power "Dance Of Death Settings," which opens a menu that allows for the adjustment of chance values, a Perk Restrction Bypass and Forcekillcams. v2.1 - New Dragon Killmove added, probabilities reshuffled, last hostile actor condition removed from Dragon Killmoves. OnlyPlayer killmoves system introduced. In-game readme added to the bookstand to help new users configure the mod. 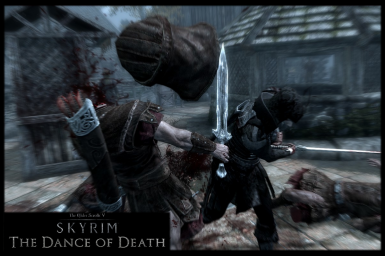 v2.1.5 - Prevents Warhammers from decapitating enemies, added new Warhammer/Battleaxe killmove. 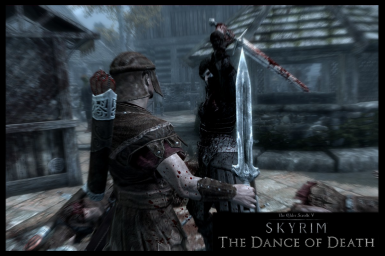 Dual Wielding now has two decapitation killmoves; one for mid-combat, and one for last enemy. One new Sword and Shield killmove added, and one killmove for One-Handers with either nothing equipped in the offhand, or a spell. Relocated the Spellbook and stand to behind Farengar's Map Board. OnlyPlayer now also affects Dragons. v2.1.6 - 1 New H2H killmove. OnlyPlayer changed to Player Immunity. Bug fixed with Warhammer decapitation prevention. Maces also no longer perform decapitations. v2.2 - The Dance of Death power is now automatically given to the player on starting the game, along with the readme note. 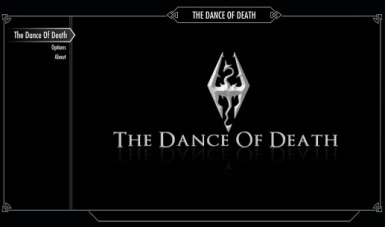 Spell name changed from "Dance Of Death Settings" to "The Dance Of Death." Dance Of Death Spellbook and Lectern removed from Dragonsreach. Menus and messages updated. 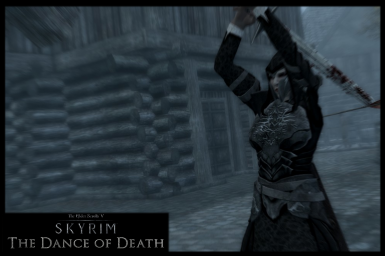 2 New Waraxe killmoves and 1 new mace killmove added. v2.2.1 - Dual Wield Decapitation alternation system fixed. 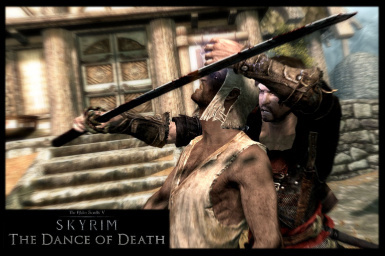 1 New Battleaxe/Warhammer killmove added. One-handed decapitation can now be used by Greatswords. Greatsword Decapitation system restructured. v2.3 - Added Last Enemy system. Added 2-Handed killmoves vs. various creature types to be available to pure One-handed or Weapon-and-spell characters. 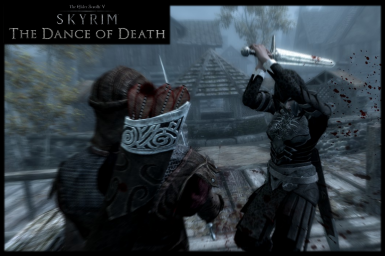 Fixed Dual Wielding probabilities to ensure better variation, and added constraints to DW impaling killmoves to prevent axes and maces from performing them. v2.3.1 - Return to loose file archiving after reports of bugs with .BSA archiving. Added faction "Has Scripted Killmoves" faction, solving a bug with scripted killmoves not performing under certain conditions. 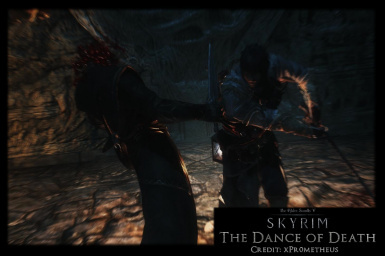 v3.0 - Full overhaul of The Dance Of Death to the 1.6 framework. New scripts introduced, .esp rewritten from scratch to accommodate changes to the Character animation tree. v3.9 - Updated to SkyUI's MCM system. All prior customisation systems removed. Additional Greatsword killmoves vs creatures added, fixed Werewolf killmoves causing freezing cameras. 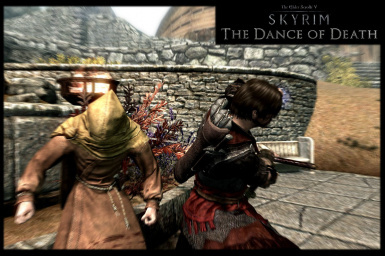 Dawnguard and Non-Dawnguard versions published. Check out my Armour Mod, The Wanderer's Surcoat! Currently, there is no setting in the CK to adjust the chance or and modifiers associated with ranged or magic killcams. If and when this is fixed, these features will also be added to the mod. 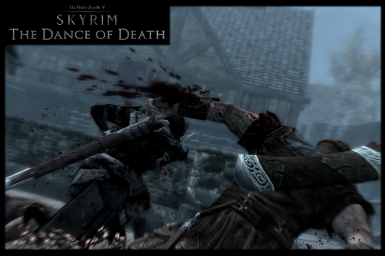 For now, adding the following lines to your "skyrim.ini" file, located in your My Games/Skyrim/ folder, will enable ranged killcams to occur for almost every valid ranged kill. Note that these may cause bugs or CTD's, and should be treated carefully. Unfortunately, the 1.6/1.7 release appears to have broken most, if not all of these tweaks, but you might get lucky with it. Feel free to tweak the settings to suit your taste. I reccommend setting "allownokill" to 0, to prevent killcams from tracking missing or non-fatal arrows. If and when new 1.6/1.7 compatible tweaks are released, I will update this list to display the newer versions.